The Fourth of July is rapidly approaching and if you’re making plans to stay in town, Grand Park’s 4th of July Block Party is definitely where you should celebrate. There will be music, food and the biggest rooftop fireworks display in downtown L.A. Best of all, it’s free! Doors open at 1 p.m. and the music starts at 4 p.m. The easiest way to get to the block party is via Metro. Take the Red/Purple Line to Pershing Square Station–Civic Center/Grand Park Station will be partially closed. For more route options, use Trip Planner. 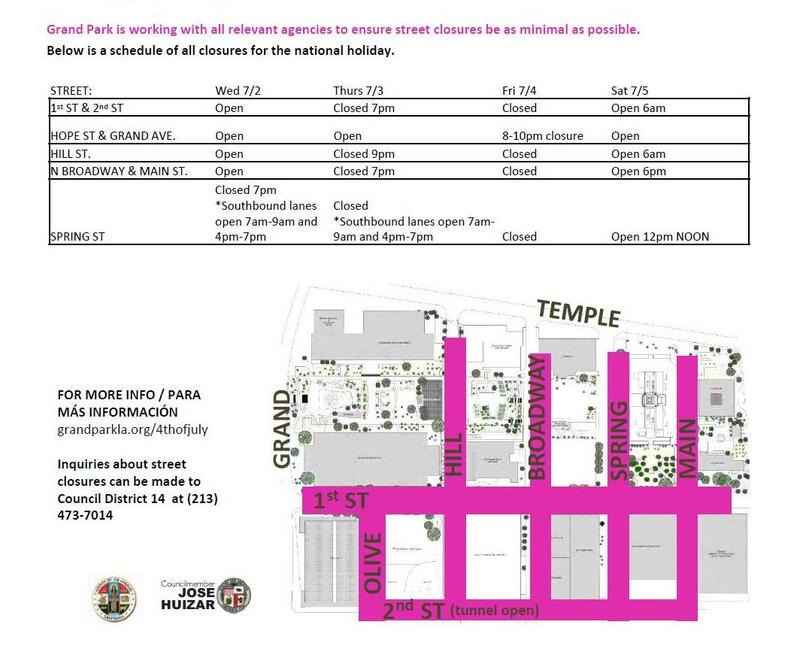 Check after the jump for dates, times and a map of street closures in the area for the block party. Really? On a day when the idea is to get people to go to Grand Park, the Civic Center station is “partially closed” and basically every street around the park is closed, as well? What does “partially closed” mean anyway? And why? It’s a long walk and uphill from the Pershing Square station (even if you figure out how to get to the 4th st. exit). Typically short-sighted planning from the city and Metro.